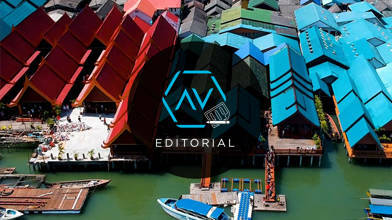 Drone pilot and AirVūz content creator 'dronevfx' soars above a 200-year-old floating village in Thailand. The village of Koh Panyee seemingly floats next to a small but tall island. It is home to about 1,500 people from 315 families that are direct and indirect descendants of the original settlers. Toh Baboo and two other families left their homeland of Indonesia by boat 200 years ago to find a fishing-rich region to live in and prosper. They discovered the waters around the towering island of Koh Panyee were abundant with fish, but due to its steep rocky cliffs the families were forced to build their homes above the sea. The hundreds of shacks and huts that make up the village are built on stilts in the shallow waters surrounding the island. This aerial video shows the unique floating architecture of this historic establishment. While the village's sole industry was fishing, it now is supported by about 60% tourism. To visit the colorful village, take a 20-minute long-tail boat ride from Surakul pier in the Phang Nga province of Phuket. “Koh Panyee - Everything You Need to Know about Koh Panyee.” Phuket.com, www.phuket.com/magazine/pan-yee-island.htm.